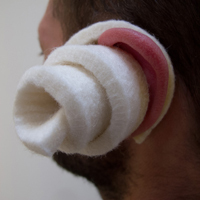 In this tactile workshop, participants will explore industrial felt as a sculptural medium. We will delve into its rich sensorial qualities and inherent material properties to create personal and experimental sculptural forms with a relationship to the body. Industrial felt is a non-woven textile composed of densely pressed wool fibres. It possesses unique sensorial qualities: muffling sound, exuding a subtle woolly scent, and being both irresistible and slightly rough to touch. 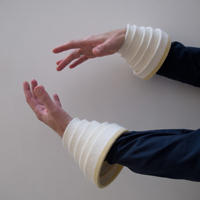 We will draw upon these qualities in creating felt body sculptures. Led by artist Ellen Bleiwas, students will explore the material's properties and test out specific techniques while playing with form, scale, repetition and contrast. Participants will then develop their own body sculptures, supported by the instructor.